Donations from area companies and individuals save kids’ lives by providing vital equipment, research treatments and charitable care. Our Champions demonstrate the personal impact that community donations — large and small — have on local kids. 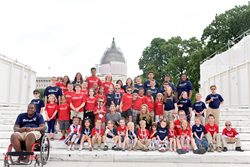 Inspiring pediatric patients from every state, Washington, D.C. and Puerto Rico will reunite near Orlando, Fla., to complete an Ambassador Tour for Children's Miracle Network Hospitals. Its purpose is to raise awareness of the charitable needs of children’s hospitals. Each child has personally benefited from donations to the charity and exemplifies how vital community support is for local children’s hospitals. The CMN Hospitals Champions program began in 1996 and has helped bring awareness to the needs of 10 million children treated at CMN Hospitals each year. This year’s Champions program is presented by CMN Hospitals’ partners Delta Air Lines, Marriott International, Chico’s FAS, Inc. and Ace Hardware. They support travel arrangements and special experiences for Champions and their families. The February Ambassador Tour marks the final leg of a tour that began in Atlanta and Washington, D.C. in June 2015. On Tuesday, Feb. 23, 53 Champions and their guests will gather at Walt Disney World Resort near Orlando, Fla. for the charity’s annual Momentum event. In addition to thanking hospital, corporate and radio and television partners for their ongoing support, Champions will share their stories with national media, participate in a satellite media tour with their hometown stations, serve as grand marshals in a Magic Kingdom Park parade and be recognized for their brave medical journeys at an emotional medal ceremony. Champions will also participate in a red carpet event with celebrities including CMN Hospitals co-founders Marie Osmond and John Schneider, Miss America 2016 Betty Cantrell, teen star and Radio Disney host Alli Simpson and others. Cantrell and Simpson both serve as official ambassadors for the charity and will accompany the Champions throughout their Ambassador Tour. To learn more about the Champion representing your state, and for a brief video from the first leg of the Ambassador Tour, visit CMNHospitals.org/Champions. Children’s Miracle Network Hospitals® raises funds and awareness for 170 member hospitals that provide 32 million treatments each year to kids across the U.S. and Canada. Donations stay local to fund critical treatments and healthcare services, pediatric medical equipment and charitable care. Since 1983, Children’s Miracle Network Hospitals has raised more than $5 billion, most of it $1 at a time through the charity's Miracle Balloon icon. Its various fundraising partners and programs support the nonprofit's mission to save and improve the lives of as many children as possible. Find out why children's hospitals need community support, identify your member hospital and learn how you can Put Your Money Where the Miracles Are, at CMNHospitals.org and facebook.com/CMNHospitals. Delta Air Lines serves nearly 180 million customers each year. Delta was named to FORTUNE magazine’s top 50 World’s Most Admired Companies in addition to being named the most admired airline for the fourth time in five years. Additionally, Delta has ranked No.1 in the Business Travel News Annual Airline survey for an unprecedented five consecutive years. With an industry-leading global network, Delta and the Delta Connection carriers offer service to 328 destinations in 57 countries on six continents. Headquartered in Atlanta, Delta employs nearly 80,000 employees worldwide and operates a mainline fleet of more than 800 aircraft. The airline is a founding member of the SkyTeam global alliance and participates in the industry’s leading trans-Atlantic joint venture with Air France-KLM and Alitalia as well as a joint venture with Virgin Atlantic. Including its worldwide alliance partners, Delta offers customers more than 15,000 daily flights, with key hubs and markets including Amsterdam, Atlanta, Boston, Detroit, Los Angeles, Minneapolis/St. Paul, New York-JFK and LaGuardia, Paris-Charles de Gaulle, Salt Lake City, Seattle and Tokyo-Narita. Delta has invested billions of dollars in airport facilities, global products and services, and technology to enhance the customer experience in the air and on the ground. Additional information is available on the Delta News Hub, as well as delta.com, Twitter @DeltaNewsHub, Google.com/+Delta, Facebook.com/delta and Delta’s blog takingoff.delta.com. Marriott International, Inc. is a global leading lodging company based in Bethesda, Maryland, USA, with more than 4,300 properties in 85 countries and territories. Marriott International reported revenues of nearly $14 billion in fiscal year 2014. The company operates and franchises hotels and licenses vacation ownership resorts under 19 brands, including: The Ritz-Carlton®, Bvlgari®, EDITION®, JW Marriott®, Autograph Collection® Hotels, Renaissance® Hotels, Marriott Hotels®, Delta Hotels and Resorts®, Marriott Executive Apartments®, Marriott Vacation Club®, Gaylord Hotels®, AC Hotels by Marriott®, Courtyard®, Residence Inn®, SpringHill Suites®, Fairfield Inn & Suites®, TownePlace Suites®, Protea Hotels® and MoxyHotels®. Marriott has been consistently recognized as a top employer and for its superior business ethics. The company also manages the award-winning guest loyalty program, Marriott Rewards® and The Ritz-Carlton Rewards® program, which together surpass 54 million members. For more information or reservations, please visit our website at http://www.marriott.com, and for the latest company news, visit http://www.marriottnewscenter.com. The Company, through its brands, Chico's, White House Black Market and Soma, is a women's specialty retailer of private branded, sophisticated, casual-to-dressy clothing, intimates, complementary accessories, and other non-clothing gift items. Chico’s FAS, Inc. currently operates more than 1,500 boutiques and outlets across North America, Puerto Rico and the U.S Virgin Islands. Each brand publishes a monthly catalog and offers online shopping at http://www.chicos.com, http://www.whbm.com and http://www.soma.com.